Olabisi Onabanjo University, OOU postgraduate programmes admission forms for the 2016/2017 academic session (on part-time and full-time bases) are on sale. Applications are invited from suitably qualified candidates for admission into the Postgraduate Diploma and Degree Programmes of the Olabisi Onabanjo University (OOU), Ago Iwoye for the 2016/2017 academic session. 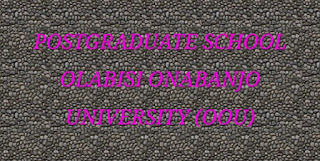 DURATION OF OLABISI ONABANJO UNIVERSITY POSTGRADUATE PROGRAMMES. OLABISI ONABANJO UNIVERSITY POSTGRADUATE PROGRAMMES ADMISSION REQUIREMENTS. 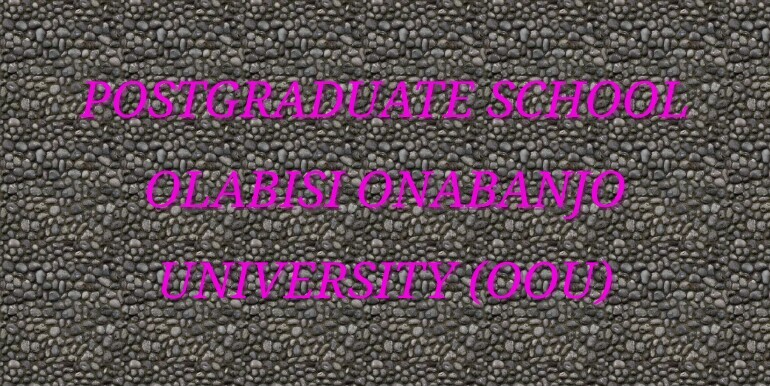 (i) Graduate of the Olabisi Onabanjo University or any other approved University. (ii) Holders of Higher National Diploma at not less than Lower Credit level. (i) Candidates who obtained their Master degree in relevant disciplines from Olabisi Onabanjo University with a minimum of 3.50 Cumulative Grade Points would be allowed to register for Ph.D. programmes directly. (ii) Candidates from Olabisi Onabanjo University with Cumulative Grade Points of 3.00 to 3.49 will only be admitted for M.Phil/Ph.D. and not Ph.D. directly. Their candidature for Ph.D. shall however be determined on the basis of their performance after two (2) Semesters course work. (iii) Candidates who obtained their Master degree in relevant disciplines from other Institutions apart from Olabisi Onabanjo University with a minimum of 3.00 Cumulative Grade Points on a 5 point Scale or Weighted Average of 50% will only be admitted for MPhil/Ph.D. Their candidature for Ph.D shall however be determined on the basis of their performance after two (2) Semesters course work. (b) Holders of Bachelor of Law (LL.B) Degree of Olabisi Onabanjo University or any other University recognized by the Senate of Olabisi Onabanjo University who do not meet the requirement in (a) above but hold the Postgraduate Diploma in Law Degree. (a) Five O’Level Credit including English Language and English Literature in West African School Certificate Examination or any other approved Examination. Pass in O’Level Mathematic l is also required. (b) Bachelor of Laws (LL.B) degree of this University or any other recognized University with at least Second Class Lower Division. (d) Candidates with Master of Law (LL.M) of this University or from recognized University with at least 3.00 cumulative Grade Point Average (CGPA) on a 5 – Point Scale or Weighted Average of 50% will be admitted through M.Phil./Ph.D. Graduates of this University or any other approved University holding a degree equivalent to at least 22 or GPA of not less than 3.0 in any of the following disciplines: Pharmacy, Chemistry, Biochemistry or Botany. Candidates may however be required to satisfy a selection process. (a) Holders of a good First Degree in Pharmacy (unclassified) from Olabisi Onabanjo University or any other University approved by Senate of Olabisi Onabanjo University. (b) Holders of a classified Pharmacy degrees not below Second Class Honours (Lower Division) or CGPA of not less than 3.0 may be admitted. (c) Candidates must have scored acceptable grades (not less than C) in Pharmaceutics courses in their final year undergraduate examinations. (a) Holder of a Master of Sciences Degree (M.Sc.) in Pharmaceutical Chemistry/Medicinal Chemistry from this University or an equivalent qualification from any other approved University with a B+ (60) average. (b) Holders of a Master of Science Degree (M.Sc.) in Chemistry, Biochemistry from this University or any other approved University, with a B+ (60) average. (c) Holders of a degree of Master of Philosophy (M.Phil.) or equivalent in Pharmaceutical Chemistry from this University or any other approved University. i. The University Matriculation requirements of individual Departments running the programme must be satisfied before a candidate can be considered for admission. iii. All programmes in the University require O’Level Credit pass in English Language in addition to four other credits in relevant subjects. iv. O’Level credit pass in Mathematics is required for Science, Social Science, Management Science, Educational Science, Educational Management and Educational Social Science based programmes. v. All Academic Transcripts must reach the Secretary, Postgraduate School not later than Friday 2nd September, 2016.
vi. All Ph.D. candidates are required to contact the relevant Departments for availability of Supervisors and vacancies before applying. vii. Every applicant is required to submit photocopies of all certificates listed in the application form such as Degree, Diploma, NYSC and Professional Certificates at the relevant Departments. Please note that the earlier dates scheduled for the qualifying examinatons has been postponed till further notice. DEADLINE: All completed applications should reach the Secretary, Postgraduate School not later than Friday 30th September 2016.